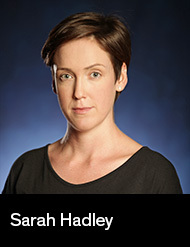 Sarah is a stage and screen director. In 2013, Sarah completed a Bachelor of Media (Screen & Sound) at the University of New South Wales with Honours in Film. Prior to studying a Master of Fine Arts (Directing) at NIDA, Sarah worked in Film and TV Production around Australia. Sarah has an extensive cinematography portfolio. Her recent directing credits for stage include: Christie in Love by Howard Brenton (NIDA 2017), Little Eyolf by Henrik Ibsen (NIDA/National Theatre Drama School 2017), In a Year of 13 Moons by Rainer Werner Fassbinder (NIDA/National Institute of Circus Arts 2017). Her recent directing credits for screen include: Swiss Crème Sandwich (short film 2017), Pick Up (short film 2017), Cut You Deep (triple j Unearthed music video 2017), 4.48 Home Video (short film 2016), Acting Unemployed (webisode 2016), RED (music video 2016). Sarah is co-founder of independent stage and screen production company Sotto. Australia and Ireland. Sarahʼs current obsession is the interception of design aesthetic with parallax across performative visual mediums.